A few weeks ago, I answered the phone with a scratchy, nasally tone noting the soreness in the back of my throat. “Got a cold?”, my girlfriend asked. “Yup” I answered as I sneezed and blew my nose for the umpteenth time. “I sat next to a woman on the flight yesterday who was coughing her head off and it was inevitable that I would wake up this morning with her cold!” While I rambled about how I thought there should be a medical check point right before the security check at airports there was a knock on my door. I opened the door only to find my girlfriend with her phone pressed tightly between her left ear and her shoulder as she retorted “…Just what we need, a medical check point, another delay to get to our gate!” She had a container of hot chicken soup in her right hand! How did she do that without skipping a beat? Chicken Soup, exactly what I needed!!! After all, this was no “common cold”. Incidentally, I detest the term “common cold” as whenever I have a cold there is nothing common about it. Mine is always the worst! It didn’t matter that it was only 8:30 am, chicken soup was the only thing that would knock this cold out of me. 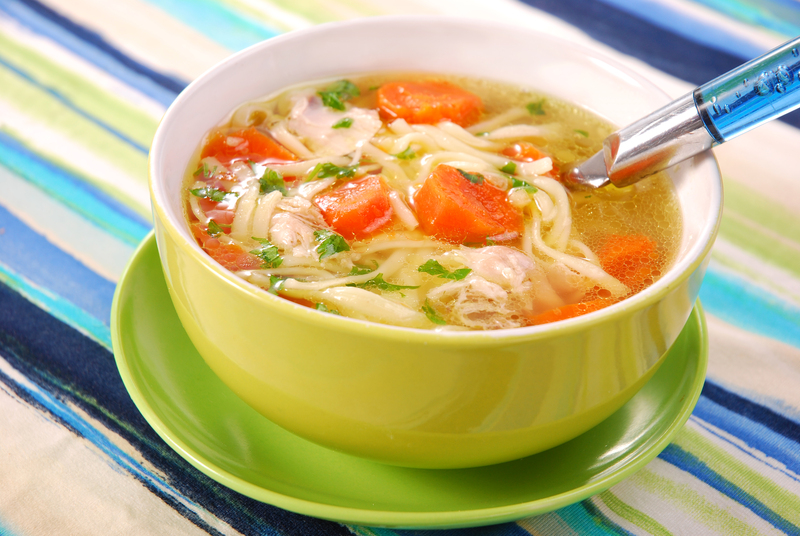 I remember well a 2007 NY Times article by a pediatrician claiming that chicken soup may be a better choice than any over-the-counter cold medicine. And to think this chicken soup was home-made, hand delivered, and arrived before I even thought of it! What a world! Three bowls later, I was well again! Lately with the stress of trying to sell my Condo, I was feeling down and out just like a few weeks ago when I had the actual cold. I was in need of a kind of “cure” that the bowl of chicken soup provided. As a result, I took the 4 tickets I won for the New York taping of the Rachel Ray Show, researched Broadway shows, some current restaurants, and made some phone calls. My four-day excursion with a “Bowl of Friends” took on a life of its own, eliminating any pre-trip stress, encouraging a ton of laughter, and sharing. The TV Show taping was fun and easy as we laughed and clapped on cue and took home over $400 worth of prizes. “Hamilton” on Broadway is a must see for anyone wishing to be blown away by a rap/hip hop history lesson. We walked the High Line for incredible sites, went to the Observation Tower at the 911 Memorial for an awesome panoramic view of Manhattan,and ate far too much at two incredible restaurants, Santina and Modern. We walked and talked, shared stories from our past, and just enjoyed hanging out together. And, in lieu of a hotel, we stayed in a century old home in Rumson, NJ. The “bowl of friends”, like the bowl of chicken soup, was a mixture of several different things blending together to become something uniquely wonderful. This excursion was all I needed to feel good again. This entry was posted in Uncategorized and tagged Chicken soup, cold, comfort, common cold, cough, personal develoment, stress, stress management, Successtrogen. Bookmark the permalink.